The UK’s largest tower crane supplier has invested in a fleet of JCB generators with an order for 18 units. 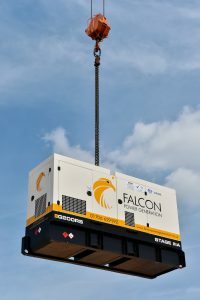 Falcon Tower Crane Services Ltd is buying a fleet of JCB’s new rental generators, including G100RS, G150RS and G200RS offering power outputs of 100kVA, 150kVA and 200kVA. The company has evolved from a regional tower crane supplier to an international brand, selling and renting tower cranes all over the world. 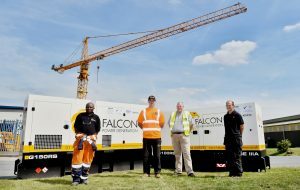 Falcon Tower Crane Services has responded to demand in recent years, to include a power division hiring diesel generators from 45kVA up to 300kVA to support power requests on construction sites nationwide. Mr Teanby said: “JCB’s RS models have some great features which make these generators very versatile. 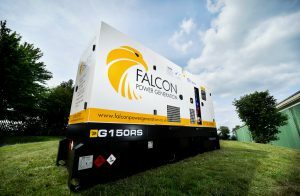 They’re also built to be tough which is important to ensure we can offer our customers the most efficient power generators, that are easy to use and most importantly they withstand the test of time and the rigours of construction sites. JCB Power Products Sales Director Adam Snelson said: “We are delighted to win this first order together with Scot JCB for Falcon Cranes Power Division. JCB Power Products has been developing the rental generators to fit customer requirements in many different sectors and this is a testament to the quality and versatility of our range of rental generators.